Our inspiration was the video game Guitar Hero, where buttons on a guitar-like controller are pressed in time with "notes" on a screen moving toward the player. This project is quite the opposite although visually similar. As the user of Music for the Deaf plays the electric guitar, the sound waves (represented as lit LEDs on a light strip) appear to move away from the player. It is essentially a audio visualization in the form of an LED light strip. It takes as input an analog signal from an electric guitar amplifier and illuminates LEDs on the light strip that propagate across the strip similar to a wave. The colors vary according to the frequency of the note being played and the light intensity varies according to the magnitude of the sound. 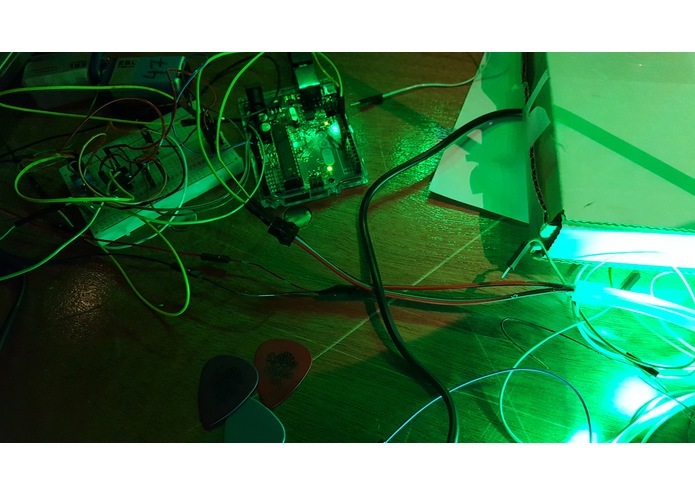 We used an electric guitar, amplifier, Arduino Uno board, breadboard, various circuit components, and the equipment (oscilloscope, power supply, multimeter) in the EE lab. 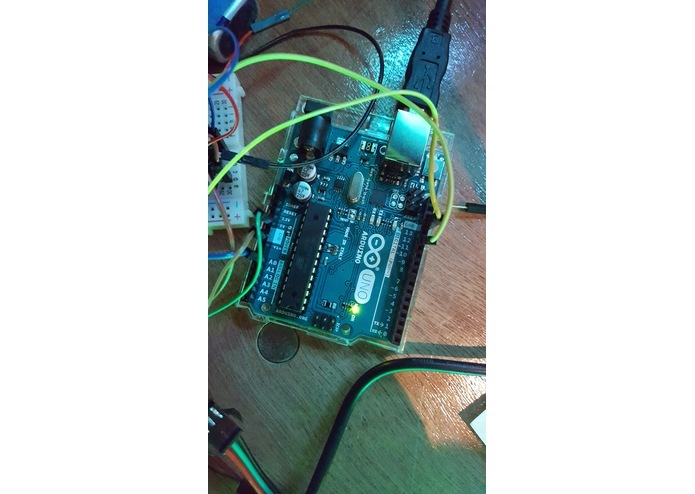 Using the analog output from the electric guitar's amplifier meant that the signal contained plenty of noise by the time it reached the Arduino for processing. Luckily we were able to build a suitable amplifier circuit to filter out most of that noise. 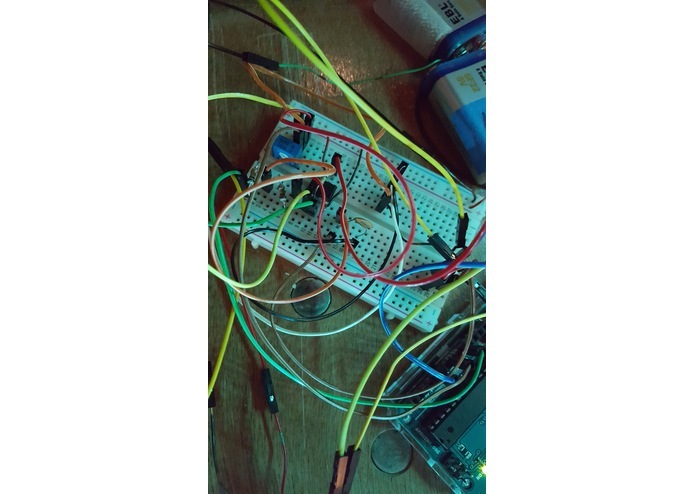 Determining the frequency of the analog signal proved to be quite difficult, as various DFT/FFT libraries were incompatible with our 8-bit Arduino Uno. We opted for an alternate method that involved counting the number of times the voltage crossed a threshold during a sampling interval. Even with our circuit optimized to reduce noise, the remaining noise made it difficult to have our LEDs produce the colors we intended. There were large frequency spikes, in part due to the method we used to determine the frequency of the input signal. In order to compensate for this, we crafted an algorithm that accepts a "contender" frequency (one that differs from the previous few samples) only if there are more samples that fall within its range. We had very little prior hardware experience, meaning we never touched an Arduino before. By the end of the hackathon, both of us felt quite comfortable working with the board. Hardware hacking is rewarding, but can be quite frustrating. Anything can go wrong– bad components or even faulty lab equipment can lead to hours of debugging. Purchase more light strips and create an 2D array out of them. This expands the range of possible visualizations, such as a ripple effect.